Remote work is all the rage, and the rise of internet-based companies to meet the ever growing demand is evidence of that. It seems like every day I come across a new company that is trying to help people live the “remote work lifestyle dream” of working from anywhere, at any time, in whatever way they please. A poll conducted in 2015 found that a full 68 percent of college grads would weight a potential job more favorably if the company allowed remote work at least some of the time. And when you have companies willing to pay people $10k to move from the Bay Area and sites like NomadList and RemoteOK (both built by the same developer) springing up to serve these needs, why not? With proper internet and attention to timezones, you literally can work from anywhere. I did it last year on an around the world trip where I worked from Prague, Vienna, Budapest, the Moscow airport, and Japan. With all this going on, what are some of the recent trends that have popped up to help remote workers and nomads stay sane and productive? Imagine going to an island paradise and being able to stay, work, and meet new people who are in a similar life stage as you are. This is becoming more and more possible with the rise of sites and startups like Outsite, which is a network of coliving/coworking houses in “beautiful places” around the world such as Hawaii, Brooklyn, Costa Rica, and four places in California. Others include Hub in the Canary Islands and Nomad Life in Nicaragua. Now, these places seem perfect. They’re on the beach, in beautiful places, and full of smart people. But does any work actually get done? It’s all possible with a little flexibility and letting go of the control you’d normally have when working from home or your own office. Sites like Remoters.net can also connect you with coliving spaces around the world. 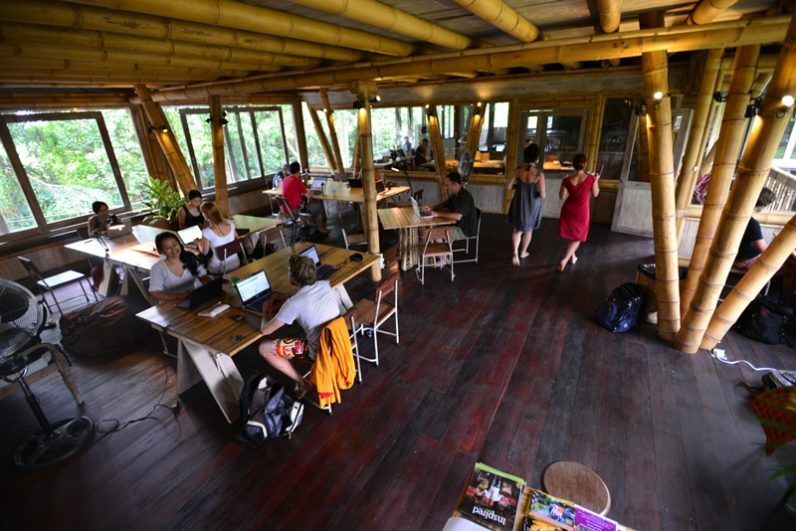 If you like to travel and have a hard time being productive from your apartment or house where you are staying, or you simply get lonely and want to meet other travelers, then coworking spaces are your best bet. Coffee shops are a mix of people, but you are guaranteed to run into interesting, smart, and like-minded people at coworking spaces. Most coworking spaces offer day passes or weekly access so you can work from there when you like, but are not tied into a monthly membership. My favorite site to use to find coworking spaces is Workfrom. I found my favorite coffee shop in Prague, Monolok, on there as well as Locus Coworking space which was near the neighborhood where my wife and I stayed. You don’t have to only use coworking spaces while you’re traveling, though. Many remote workers will rent an office or a desk at a coworking space in their city simply to have a place to get out of their house or apartment. One of the rising saving graces of remote workers, who are often alone with their laptop and not on a beach somewhere, is public Slack groups where entrepreneurs and remote workers congregate to pass around ideas. If you work alone or only have a small team, these are a great way to bounce ideas off of other people. Some of the most popular are Online Geniuses in the SEO/digital marketing space, Startup Study Group, and Startup.chat. You can find a ton more on http://www.slacklist.info/. As with any online group or meetup, they are only as valuable as the people involved. Over the last two years I’ve joined and left probably 20 Slack groups, but the ones I have remained a part of have been absolutely amazing for my sanity and my business’s growth. Finally, some enterprising entrepreneurs have started creating premium groups for entrepreneurs to join. Unlike Slack groups that are free to join, these groups require you to apply and sometimes even be interviewed before you are allowed to join. Groups like FoundrClub exist to cut through the noise and actually help you grow your business. Priced at a few hundred dollars for the year, or around $40 a month, these groups offer a combination of community as well as premium content. The reason we started Foundr Club is because we saw a growing trend of entrepreneurs in the Foundr Community asking for more. They would write to us via support, or leave comments on our social media, “how did we do x ?” “how do I meet other like minded founders?” Reading our content wasn’t enough, and with a global community around the world we offered a membership that connected extremely smart founders around the world where offered premium content as well. Some people like to decry the notion that remote working will become more and more popular, especially as IBM stopped allowing it and Yahoo (now Oath) and Reddit both banned it. One could argue that both of those companies had remote working setups before the infrastructure really existed to support them. When I worked inhouse it was always a challenge to collaborate well with others, but over the years collaboration tools became easier. Remember sending Excel documents via email attachment? Now we collaborate in Google Sheets. And remember opening up Word and fighting their formatting issues before sending reports to people? Now we use Google Docs and give Commenting privileges. Companies have to set themselves up for remote success, and tools like those mentioned here can help them and solo entrepreneurs/freelancers alike to work effectively with their coworkers or clients while living where they please.